I am glad to share with you my YouTube Channel about my Travel experiences. The youtube channel is The ECMTree Channel. Do checkout the videos on my channel and please subscribe the channel as well :) If you like the video then do not forget to hit the like button. Hope you will enjoy the videos !!! Hey! Just to share with you an update I received from Packt. 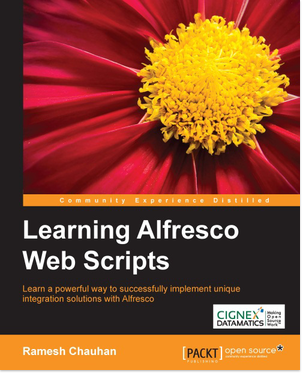 You can now get my e-book for Learning Alfresco Web scripts in just 10$. Note : I am not sure about how long this offer of my e-book availability in 10$ is valid. However, if I would get any update will surely share about it. Web scripts are an integral part of Alfresco and as a developer one must have the knowledge about it. In this book, I have done a sincere attempt to share my learning, knowledge and expertise with you. Hope you would find this book useful. Please checkout my blog which I wrote on completion of first anniversary of the book, to find out some useful details on the book. Helping alfresco community with my knowldege in alfresco. Powered by Blogger. This blog is a place for me to share my personal views, my learning, my experiences and knowledge with you, which I think may be useful and helpful to you some where some point of time. Thank you !